on the other hand, provide a public of « connoisseurs » the information they are looking for. It seemed to us that the best way to achieve this goal was to create a website to help people find, in a few mouse clicks, all they want to know about dates and places of concerts, artists´ lists, etc. In other words, the gate towards local music and derivatives. We are organized in association. bars, pubs, café-concerts, concert halls, restaurants, nightclubs, etc. willing to offer attractive entertainment. These three features constitute a whole which cannot be separated as one would not exist without the others. whose means are limited, but we will not forget the ones who have bigger structures and need some extra advertising. 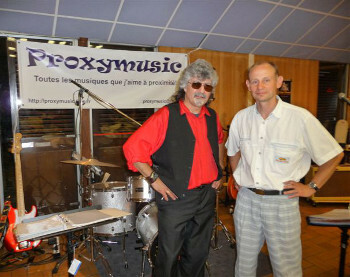 PROXYMUSIC´s vocation is not to replace any artist, it is and will remain help. If the artist already has an active website we will post a minimum of information and provide his website address as well as the related links. On the other hand if the artists does not have a website yet, we will provide detailed information. Who hides behind Proxymusic ? A few volunteers only ! in charge of the content. An experienced entertainer inoculated against bird flu, mad cow disease, etc), kind of the Reuters Agency on his own thanks to his sense of contact, his address book and his passion about music. He never sleeps or of one eye only ! in charge of the « packaging ». The designer of the site who plays with PHP, XHTML, CSS, RSS, AJAX and other "e-barbarians". A guy who works hard for the surfer to find easily, nicely and quickly what he is looking for. in charge of the concerts. Last recruit of Proxymusic, she is risponsable of the contribution for concerts and their flyers, a big working volume indeed. A draft of oxygen for Proxymusic. in charge of the artistes and the concert places. After entering thousand of concerts, she is now risponsable of the contribution for artists data and concert places data. A model of dedication.